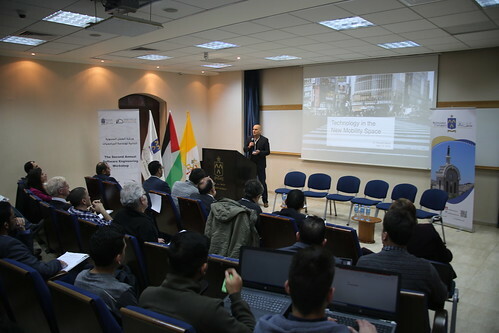 The Department of Software Engineering at Bethlehem University held its second annual workshop on Software Engineering on Wednesday, 10 April 2019 at Furno Hall. Information technology professionals and software engineers from the private sector attended the workshop in addition to members of faculty, staff and students. The workshop was sponsored by PALAst, ProGineer Technologies, iconnect tech, and Transcend. The workshop aimed to bring together and provide a forum for experts in software engineering research, practice, and education from both academia and industry to present and discuss problems, experiences, trends and most recent advances in the field of software engineering. In his opening speech, the workshop Chairperson, Dr. Wesam Herbawi, welcomed the attendees and introduced the speakers and the program. Executive Vice President, Dr. Michael Sansour, said that this unique workshop aimed to bring together researchers, industry leaders, and managers from abroad to meet and share ideas and simulate discussions in the area on software. Prior to the panel discussion, Mr. Peter Karich spoke about open source and its uses through his workshop on “Learn from open source… and when to avoid it.” He highlighted the advantages and disadvantages for using, creating and contributing to open source software. Prof. Jihad El-Sana talked about the augmented reality as it opens new avenues for developing novel immersive digital experiences that are visually tied to the world. In his talk, Prof. Juan Merelo made an introduction to the key concepts in cloud computing, how it changed development, and mapped the layout of the new cloud territories, giving pointers about how to navigate in them. In his presentation on “How to be a Smart Software Engineer,” Dr. Murad Al-Rajab explored some ideas that would inspire students to be Smart Software Engineers. After the workshop, the students gathered for a hackathon and enjoyed the evening while programming.